A few years ago, a dear friend of mine and I had a very heated debate on the topic of caste based reservation. While my friend attributed reservation as a right thing, I kept arguing on the negative aspects on it, and stressing on the need to have an economic basis for reservation, not a social basis for it. My friend kept pressing that I read up more about reservation before being so vehemently against it. Right now, its admission time, and I think it is absolutely necessary to talk about a topic a lot of ‘general category’ people frequently discuss about – reservation. And I will tell you, where we (i.e general category people) go wrong. I am a general category, Brahmin girl, and to admit it, I am obviously privileged. Not as much as a Brahmin man, but still, privileged. I have grown up in a middle-class family, I have struggled to get educated in a good college, I have been hard-pressed to become successful because of monetary issues at home. But I am STILL privileged. You know why? Because at the end of the day, I have been born into a high-caste Hindu Brahmin family, and I have never been subjected to any rhetoric that mocks my ‘caste’. 65 years into Independence, we have progressed by leaps and bounds economically. While some people got elevated, others didn’t. Post independence, Ambedkar established reservation in the Constitution for the lower castes (I hate to refer to them as lower castes, they are our own people and deserve the same level of respect. But for purposes of distinction, I will currently stick to the term lower castes). Now they are notoriously called by the Constitution as ‘SC/STs’. The OBC’s are a third category, used to refer to castes that are socially and economically disadvantaged. The highly controversial Mandal Commission report of 1980 found 52% of India’s population to consist of OBCs. Reservation and its repercussions isn’t a new term of debate. Its a debate going on for years. From the time of the Mandal Commission, General category students have flocked to the streets protesting against reservation that ‘takes away their seats’. My plea to the General category students is- Please understand who takes reservation and that you aren’t affected by it. 1. Reservation DOESN’T take away the seats of the General category. In fact, the population of SC/STs and OBCs is larger than the General category in India. And we still get greater seats. 2. We aren’t affected by reservation. There may be economically advantaged SC/ST’s and OBC’s who take reservation, but they are taking away the seat of an economically disadvantaged SC/ST/OBC. Not YOU. 3. You may abuse reservation as much as you want, but will you ever be subjected to societal abuse like them. Even if an OBC/ST/SC candidate is talented, they are still labelled, “lower caste” by the Upper castes. If an OBC or SC/ST ever tries to explain this to you- you will never understand. Because it’s in our social training to not take into account the views of the disprivileged. 4. Reservation is NOT for economic elevation. Its for social elevation. That hasn’t happened, that’s why its still there. I am a Brahmin girl, if I decide to marry an SC/ST, will my parents agree? I don’t think they will. Why not? Because my friends, caste hierarchy still exists in this country called India, which we call a ‘democracy’. Now, a lot of general category people will point out that SC/ST’s and OBC’s have lower cut-offs making it easier for them to get into good colleges. Of course, thats an issue, merit should be equalised, but… the cut -offs were lowered for those people who face rampant discrimination till date in smaller towns and villages. And their seats aren’t getting filled because many of them can’t make it to school because people of OUR caste refuse to study with them. And when their seats don’t get filled – they are given to US. And the economically advantaged who do take the benefit of reservation are looking for social elevation folks – which unfortunately the institution of reservation hasn’t been able to give them because people like US won’t give it to them. If you think I am part-Brahmin, and one of my ancestors is SC/ST, that’s the reason I “bleed” for them, then you’re very well mistaken. I am disgusted that we still live in a society where Caste as a term exists. If you think I am for/against someone, I can just clarify that I am humane, unfortunately. Reservation should have abolished caste years ago, it hasn’t been able to, because we as a society still uphold the institution. I am still referring to myself as ‘Brahmin’ because unfortunately, that is a term I have been trained to use to distinguish me from the ‘others’. And it sticks to my tongue, unconsciously, due to years of social conditioning. We have been accused of spreading hatred between SC-ST and the Hindus and vitiating the atmosphere of the institute. We are surprised and slightly amused. Are SC, ST not part of the so-called ‘Hindus’? How MHRD and IITM is perceiving such a venomous anonymous mail with full of hatred towards the SC, ST and Ambedkar? Are we the one who polarise the students or they are the one who think IITM is their own base to propagate against the interest of SC, ST, OBC who are the majority in our Society? Rather our organization is engaged in propagating Ambedkar and Periyar thoughts, in helping depressed castes and the caste Hindus to realize the evilness of caste-based discrimination taking place in modern India and expose the ideology functioning behind such discrimination. When we talk about the hierarchical caste structure existing in Indian Society, inevitably we end up in talking about the present pathetic condition of peasants and labours. There are a number of sociological studies that will bear us out when we say that caste-based discrimination is still very strong in our society, that caste-based associations can leave some with privileges that add up throughout their lives while those that are excluded face powerful social barriers to their attempts to improve their social and economic status. We have only been discussing these issues with an aim to make a common platform for all students inspite of their caste and creed so as to dismantle the evilness of caste barriers. However, even in 2015, our activities are seen to be too radical by the religious right. If the religious right has the right to be offended, then don’t the oppressed Dalits and Bahujans who still face powerful prejudices have a right to be offended with the state of affairs? Our pamphlets do not have any material that would surprise a sociological or political scientist. Yet, the institute has taken these complaints seriously and has chosen to derecognise our organisation. I am not saying that Brahmins and other upper castes don’t face any problems. Yes, a lot of us are in a minority and are labelled as ‘casteists’, when we actually aren’t. I have myself been assumed as ‘casteist’, just because I have an upper caste surname, whereas I believe caste as an institution is the worst thing Indians are born with. I find it even more disturbing that caste has permeated other religions in India too, like Sikhism, Islam and Christianity. As a young student, I was very angry about reservation. I was very angry about the lower cut-offs for the ‘other’ people. But has our collective anger ever substantiated into equality for other people? No. We still practise Brahmanical traditions, we still like to distinguish ourselves as “upper castes”. And occasionally we love to talk about those ‘privileged’ SC/ST’s who derive wrong benefits out of reservation. But folks, the terms ‘privilege’ and “SC/ST” don’t go together! They are not privileged! They are still treated with disgust, contempt. In good colleges, when they don’t perform well, its attributed to the fact that they sought reservation. But reservation isn’t our fight, it isn’t our war. We need to reform ourselves first before we turn around and abuse the institution of reservation. My plea is for all students reading this article. Population boom is the reason for our woes, don’t blame it on other people. Seats in colleges haven’t increased in proportion to the number of children born in this country, if we don’t think conscientiously, how will we change India? How will we change our society? I was once in your boat, a very angry student who had a problem with reservation, especially during the JNU entrance. (JNU has over 50% reservation – but there are different categories of reservation, not all seats are given on the basis of caste). Back then, my friends who sought reservation maintained a dignified silence – you know why? Because they know that we won’t change. It’s time we do. It’s time we take up the mantle of equality, and give everyone what they deserve- respect and adulation. Forget that we are Hindus, forget that we belong to a particular sect, embrace humanity. Be happy that there is beauty in being alive, there is beauty in having a free spirit. Half of our inhibitions will disappear, I promise you that, and the road to progress will be smoother. But the only way that can happen in India, is by doing away with our surnames, and everything else associated with “caste”, including our high-handedness. I am only talking about education here, lets not bring up those disgusting jokes that point that fields like Acting and Cricket don’t have SC/STs and OBC’s in them because there is no ‘reservation’ in these fields. I will just point out that it is plain ignorance if you assume that singers Daler Mehndi, Mika Singh and India’s greatest Athlete PT Usha are from the ‘Upper castes’. And their struggle has been tougher because they belonged to a lower caste. Otherwise, take a trip to a village. When you see dalits picking up our garbage, cleaning our shoes, and when you realise that our ‘privileged’ SC/ST and OBC friends aren’t exactly privileged in the first place, then maybe our eyes will open. A brahmin may clean the floors of a temple, but a kshatriya or brahmin never has to do what the harijans do for us. The Harijans are the true bastions of our country, the people on which this country stands. Don’t break the country in the name of religion and social hierarchy, I beg of you. Next Post World – you may love Zindagi Gulzar Hai- I didn’t. Hi Ankita. Wonderfully written and very valid points made by you. Some of these points were even overlooked by me initially. Most of the young educated folk tend to not have this simple understanding of the society due to various reasons but I commend you about having a fresh perspective about this age old debate. If you don’t mind, I’d like to share a link to this article on facebook. Thank you Pranay. You’re very kind. You are free to share the article wherever you want. I hope it creates some level of awareness. one more thing , which is more devastating ” massive exposure of media to anti-reservationists” . I wanted to bring out conversation on this debate and I agree, economically advantaged is a wrong term to use. But i felt that I needed to talk to everyone in a language they spoke in, to make them understand how absolutely baseless it is for them to criticize something without putting any thought into it. Reservation has elevated some people from absolute poverty and brought them into an upper ‘class’ society, but what goes inside the house, in their mindsets, one can never know. As long as mental and physical barriers stand, things will not change. 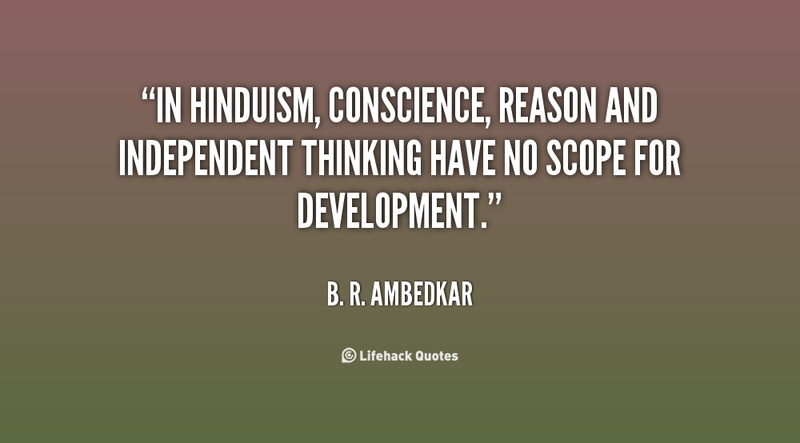 We need to be the proponents of change, as Periyar was, and make this society a casteless one. this article is good step to move in a right direction . Hi Ms. Ankita iyer, your comments are the mirror reflection of a common upper castes view,whether you are rich or poor your circumstances are either well educated or well awareness people , I am saying your relatives and your co- ceste people. You can gain confidence and proper advises to a wealthy life, see about a scheduled caste person, (majority) their relative and circumstances, are in worst condition, mostly they are labour or daily coolie.how can a child coming from a such condition gain inspiration or confidence, how can they compete with others child which are come from well educated & wealthy conditions. Do you know the reasons behind it? You brahmins very first shut their doors,against mingle with others ,because they claim they are next to gods also they propagate that they come from brahmma’ s mouth and the chaturvarna. They separated peoples in the name of chaturvarna they are the sole responsible for this at ancient times,but unfortunately others followed them because in all countries common peoples follows peoples higher than them,like we still follow British in major things ,likewise every group of people shut their doors which avoids mingling with others,hence this caste system established. So for their past mistakes,now they are suffering, but what are the remedies for sudras & dalits who were suffered throughout the history, so ambedkar deserves it. my article, in no way wants to target any particular community. I know that people of my caste are particularly responsible for upholding the varnashrama dharma. And that fact disgusts me. I would have been happier if I was born a human, without any religion or affiliation. My article was particularly targetted towards students, who blame reservation for their problems and do not understand how complex the issue of caste is. I believe a good step forward will be to bring up our children without any feeling of caste, so that everyone grows up believing everyone else is a fellow human, not a brahmin, shudra or kshatriya. In rural areas, young, educated people need to help create change, and make people understand the need to change their views about caste and elevate everyone, because we are humans, we all have the same blood flowing in our veins. We have no right to discrimminate. But we first need to stop blaming each other. Upper castes need to stop blaming lower castes and vice versa. Until and unless we all abolish the caste system together, nothing will work, will it? I hope you find my answer satisfactory. I know I can never be in the shoes of a someone from a lower caste, but it was never my choice to be ‘upper caste’ either. I want to change some things that are wrong in our society, and I will stand up against my brahmin community, if need be. Because truth and honesty is the highest virtue, not caste. I like the mature perspective you have taken on this issue. It is not often that we see people show the understanding of the issue that you have shown. One should admit that the ‘caste supremacist’ feelings are not only in the privileged castes. I have noticed the OBCs also harbor a jealousy at the Dalits getting better of them due to affirmative action programs. Some of the brutal crimes against Dalits are committed by them too. We have to build a more compassionate society, not a competitive one. Lowering competition can be achieved by increasing the quality and quantity of higher educational institutions. None of those who oppose the affirmative action ever demand that the government should build more high quality colleges to meet the demands of its people. Note: I prefer to use the term privileged castes instead of upper-lower, forward-backward. It is a better term. Whatever you have written i fully agree with you… Just felt happy after reading the article… We should support every people instead of embracing them…..